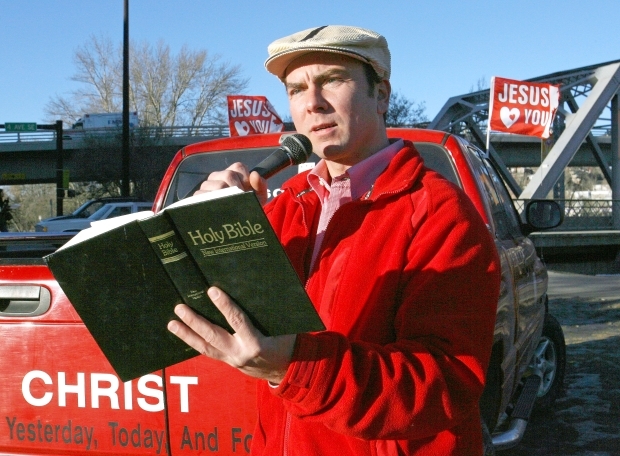 As the city gears up for Homeless Awareness Week, a controversial street pastor with an affinity for loud preaching is getting ready to go to court. Artur Pawlowski will be visiting the Court of Queen’s Bench several times this month for 20 bylaw and police tickets he and other members of his church have received. Pawlowski says the city and police unfairly ticketed his church for feeding homeless people in Calgary. Since January, Pawlowski and members of his Street Church have been given more than $2,000 in tickets for various alleged offences, including causing objectionable noise, causing unnecessary noise from a motor vehicle, jaywalking, stunting, placing material on a street, offering goods and services on a street and offering goods and services in a park. Homeless Awareness Week runs from September 14 to 22. Anyone Care About Free Speech? June 23, 2008 Artur Pawlowski Comments Off on Anyone Care About Free Speech?